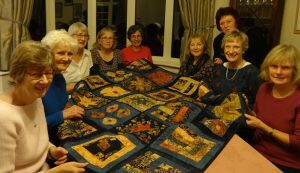 Based in the village of Draycott in Somerset, we are a small group of quilters who meet once a week to exchange ideas and sew. We work on projects to make joint quilts for charity and individual quilts for ourselves. Our work involves various techniques of machine and hand piecing (occasionally applique) and machine and hand quilting. We are currently a group of 13 members.